Using the slow cooker is a time-tested way to save time on busy days – whether holidays or just crammed weeknights. 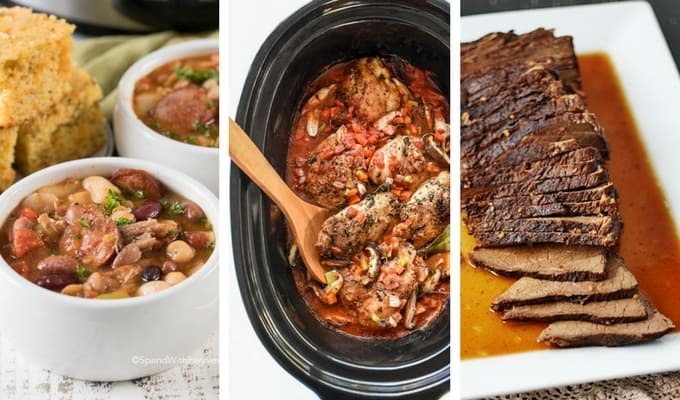 These Slow Cooker Dinner Recipes are perfect for low-key dinner prep. 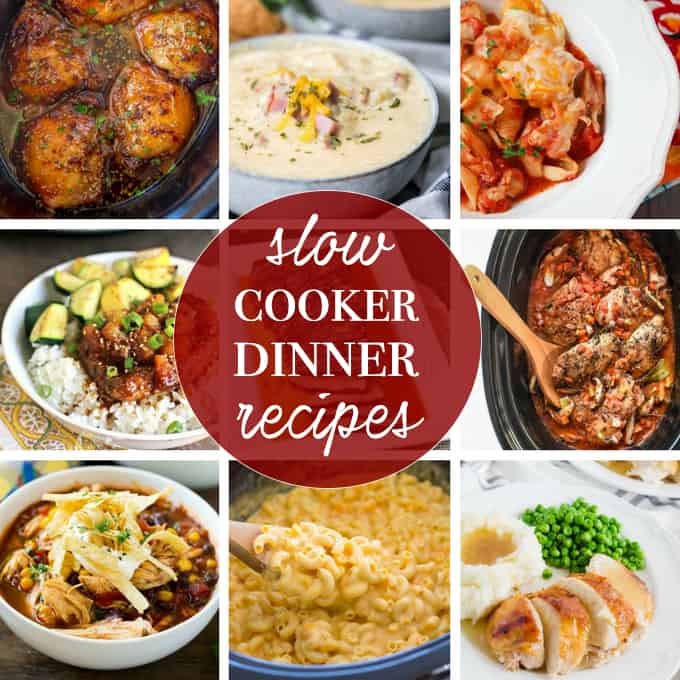 Slow cookers are a great way to streamline your meal prep, reducing the need to babysit your supper or spend hours sauteeing, basting or checking on your food. 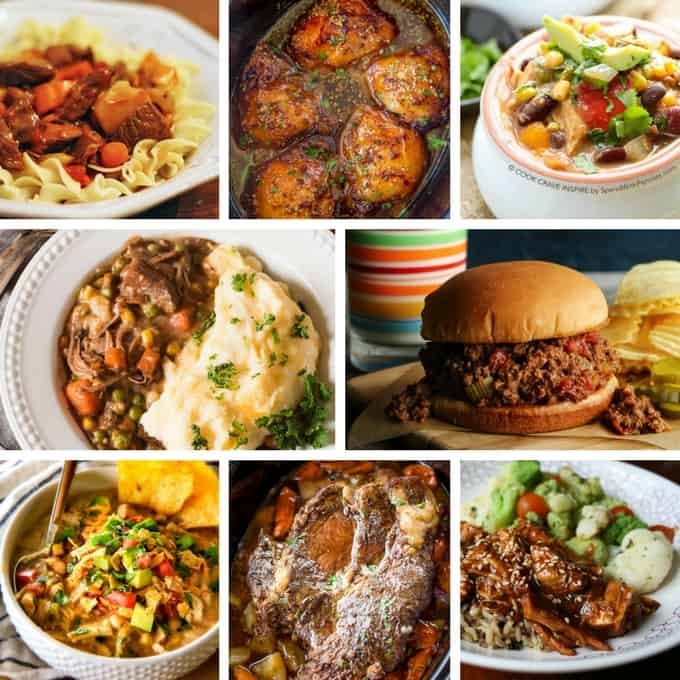 Whether you’re looking to make weeknights a little easier, avoid the drive-thru’s, or just spend more time with the family on a laid-back Sunday, this collection of Easy Slow Cooker Meals has you covered. 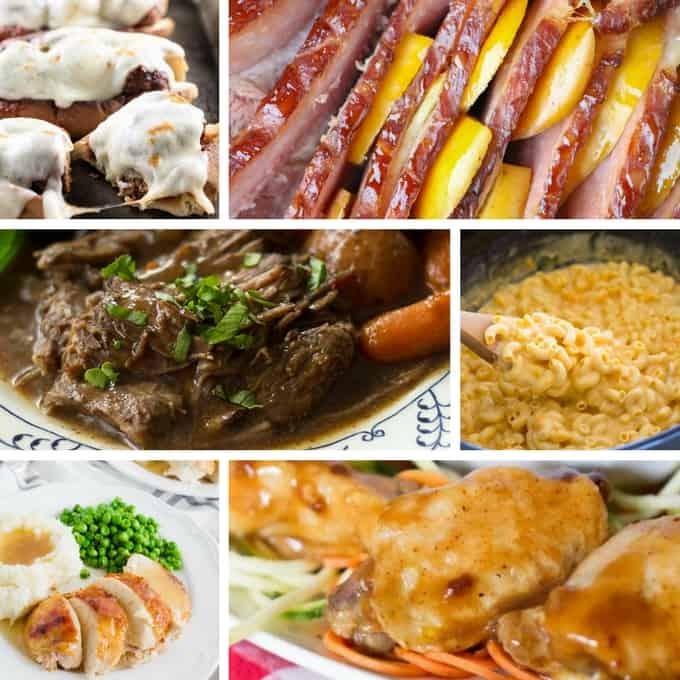 We gathered our recipes from some of our favorite (and most trusted) recipe sites so you can rest assured that your meal will come out perfectly cooked and delicious! The perfect slow cooker meal for those who like their chicken sweet & savory, a Slow Cooker Pineapple Chicken Teriyaki from Real Housemoms. These Slow Cooker White Enchiladas from Sugar, Spice & Glitter is an easy way to make flavorful chicken enchiladas. Slow Cooker Beef Bourguignon from the View from Great Island is the easiest way I’ve ever seen to make beef bourguignon. Real Housemom’s Slow Cooker Ham & Potato Soup is a hearty meal-in-a-bowl! Another delicious twist on enchiladas, a Slow Cooker Enchilada Soup from Spend with Pennies. Skip the drive-thru with these Slow Cooker McRib Sandwiches from Dinner, then Dessert. Forget spaghetti – these Slow cooker Meatballs are perfect for Meatball Subs. Sugar, Spice & Glitter’s Crockpot Root Beer Glazed Spiral Ham is perfect for a special occasion or just a special treat. Kids will love this recipe for Crockpot Macaroni & Cheese. Spaceships & Laserbeam’s Slow Cooker Barbacoa Wings is the perfect party food made in a crockpot. Our Crockpot Sticky Chicken recipe is perfect for an easy weeknight supper! Our Slow Cooker Pot Roast recipe is absolutely to-die-for! One of our favorite comfort foods is Crockpot Chicken and Dumplings, a family staple! Traditional goulash can take hours to prepare, but that’s not the case with our Slow Cooker Hungarian Goulash with pasta. Dinner, then Dessert’s Slow Cooker Brown Sugar Garlic Chicken is absolutely mouth-watering to look at (and I bet it tastes even better). Spend with Pennies’ Slow Cooker Chicken Chili would be perfect to come inside to after getting some fresh air on a cold day. I am loving the veggies in Farm Girl Dabbles’ Slow Cooker Sloppy Joes recipe. A healthier option than take-out, Sweet Sesame Chicken made in the Slow Cooker from Family Fresh Meals. Dinner, then Dessert says this is the ULTIMATE Slow Cooker Pot Roast and it definitely sounds like it just might be! 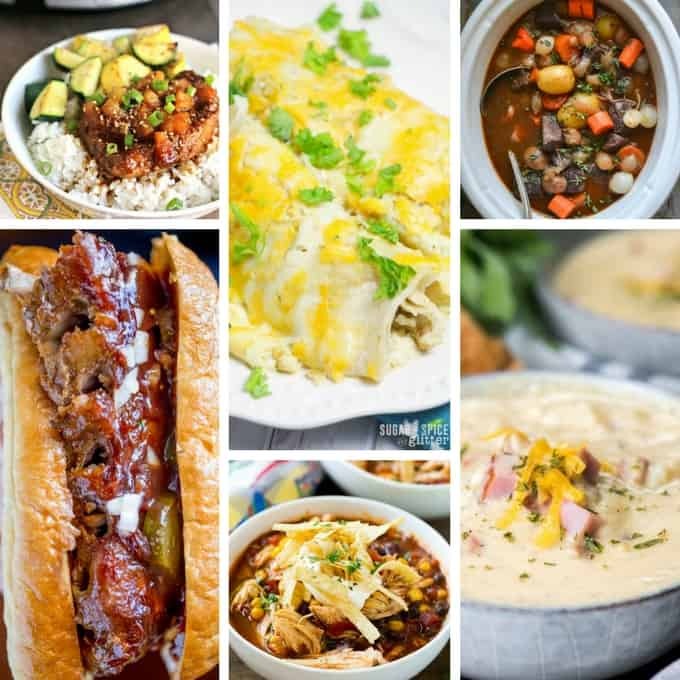 I would have never thought that you could make Shepard’s Pie in the Slow Cooker until I saw this recipe from Tastes of Lizzy T.
Slow Cooker Pulled Pork is such a classic – and for good reason! 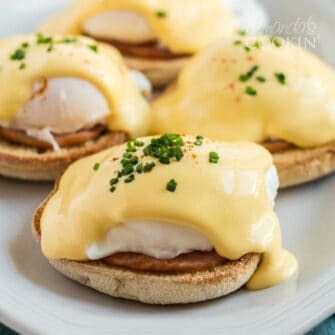 It’s delicious, easy and a crowd-pleaser. This Slow Cooker Pumpkin Soup is the perfect comfort food for fall. Our Slow Cooker Barbecue Country Ribs are perfect for a low-key get-together like a barbecue or family reunion. A delicious yet unexpected take on pork roast, a Slow Cooker Oriental Pork Roast. Spend with Pennies’ Cajun Bean & Turkey Soup would be perfect with some homemade bread or a side salad. Chicken Cacciatore without the crazy prep time with this delicious recipe from Foodie Crush. 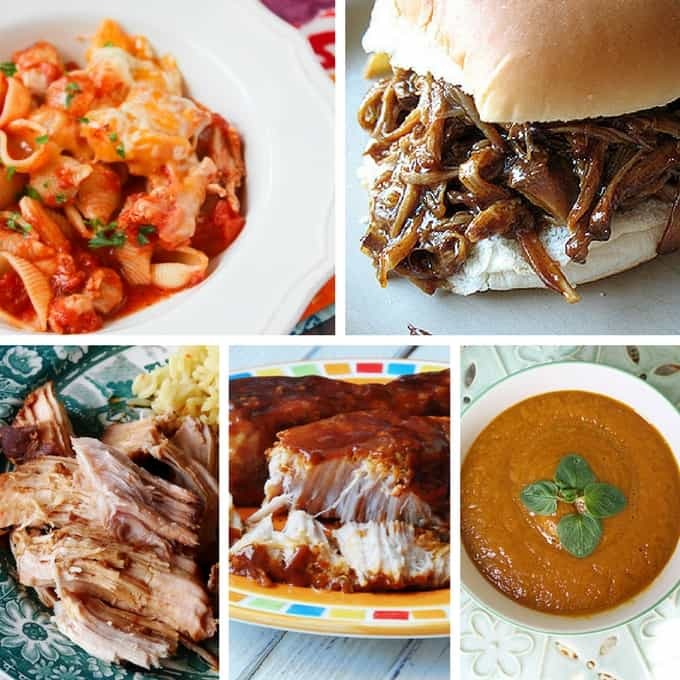 Which of these slow cooker dinner recipes is going on your meal plan for this week?